Review How important is security for a powerline Ethernet network? It's a lot less of an issue than it is with wireless networking, that's for sure. Most powerline connections are shielded by all the gubbins at the meter, but folk in buildings with many dwellings or offices and only one feed to the outside world will need to tweak the technology's security feature. Powerline adaptors based on the 200Mb/s HomePlug AV standard use 128-bit AES encryption and it's enabled right out of the box. AES isn't trivial to crack, but since the adaptors are all pre-set with the same password - to make setting up networks easier for novices - they may as well not be. Everyone who makes powerline adaptors supplies software that allows users to change the password used to encrypt data flowing between your powerline units. The snag here is that these utilities can be intimidating if you're not a techie, and they usually only run on Windows PCs - not much use if you're a Mac or Linux buff, or if you just want to connect a games console to the internet. Solwise's solution to the problem, dubbed Simple Connect, is to generate passwords randomly, literally at the push of a button, and auto-sync them with all the units on the network. The feature is implemented in its new PL-200AV Push adaptor. Each Push is clad in white plastic and is a little chunkier than Solwise's previous 200Mb/s HomePlug adaptors - reviewed here - which were coloured blue. We think the older ones look nicer, but the new models do sport better indicator lights, now represented by backlit icons rather than simple LEDs. That certainly makes it easier to see what's going on when you're adaptors are in hard-to-reach, poorly-lit corners as you're not left wondering which light is which. Now it's immediately clear which are the power, powerline and Ethernet activity lights. And the powerline light changes colour from red to orange to green, to indicate the speed of the link: under 40Mb/s, 40-105Mb/s and greater than 105Mb/s, respectively. Remember, that's the powerline link speed, not what you'll get through the integrated 100Mb/s Ethernet port. 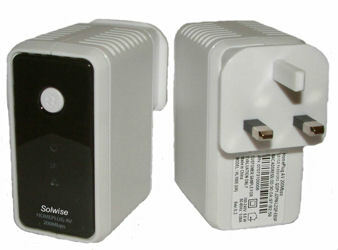 Solwise supplies the new Push as standalone units, and in pairs as starter kits. We tried the latter first, plugging the two units into sockets that currently have other 200Mb/s adaptors. Both are pre-set to work together. With the new boxes in place, bridging our Belkin router and an Apple TV box, the connection was quickly established, and the Apple TV popped up in iTunes ready for synchronisation. We connected one of the old, default password Solwise 200Mb/s units to a PC, but it was unable to talk to the router and get an IP address, so the two Push units clearly had formed a single, self-contained network.